LOCATION.--Lat 39`55'49", long 75`41'06", Chester County, Hydrologic Unit 02040205, on right bank 50 ft upstream from Northbrook Road and 2.2 mi south of Marshallton. PERIOD OF RECORD.--December 2002 to April 2004; October 2004 to current year. 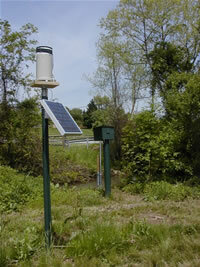 GAGE.--Water-stage recorder, crest-stage gage, and Pluvio precipitation gage. Elevation of gage is 190.78 ft above NAVD of 1988. Satellite telemetry at station. COOPERATION.--Sation established and maintained by the U.S. Geological Survey. Funding for the operation of this station is provided by the Chester County Water Resources Authority and the the U.S. Geological Survey.